70th birthday wishes: It is hard to explain in words how a person feels turning seventy. It is like sitting on a mountain peak, watching seven decades of your life unfold into a wonderful melody of memories which can be played again and again to heart’s content. It is the age when even wrinkles have a magical glow and a charming sense of grace. Read these beautiful card messages, touching greetings and funny quotes to get inspired to write something that captures this wonderful life experience. Whether your wishes are for your hero dad, beautiful mom, wobbly granddad, adorable grandma or someone else in the family – give them something to smile about, they deserve it. 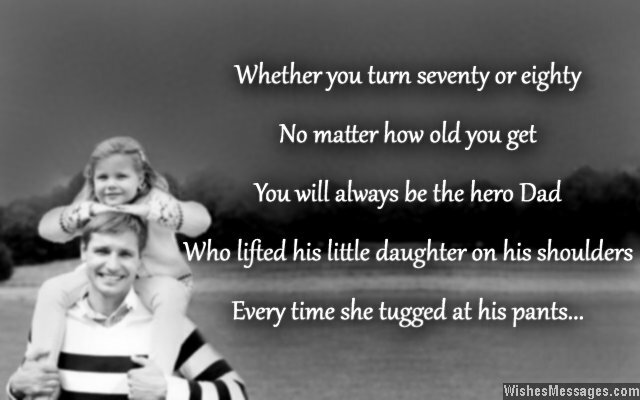 1) Whether you turn seventy or eighty, no matter how old you get, you will always be the hero dad who lifted his little daughter on his shoulder every time she tugged at his pants. I love you dad, happy 70th birthday. 2) The irony of a seventieth birthday is that the cake is large enough to hold seventy candles but you aren’t allowed to eat more than a slice. Happy 70th birthday. 3) You may have turned seventy, but your spirit makes you look twenty. Age is just a number in your life’s story, your soul will forever remain youthful and infectiously happy. Happy 70th birthday, granny. 4) Don’t worry about getting older. If you treat seventy like just another number, your body and mind will forget that there is a zero after the seven. Happy 70th birthday. 5) May your rocking chair always rock our world, may your walking stick always show us the right path and may your spectacles always teach us to see right from wrong. Happy 70th birthday grandpa. 6) Turning seventy is like sitting on the rooftop of a skyscraper – you get the most exhilarating view of life. Happy birthday. 7) If your wisdom and experience were to be auctioned, they would command a record breaking price. Happy 70th birthday. 8) You may choose to go sugar-free, but don’t abandon your delightful sweetness. Happy 70th birthday. 9) Age can never catch up with a person who has already won the race of life. Happy 70th birthday. 10) At seventy, the best policy is to see how far you have come rather than seeing how far you still have to go. Happy birthday. 11) Your wrinkles look so beautiful, the mellowness in your personality looks so graceful, your timid expressions are so joyful and your wisdom is so powerful – it is hard to explain in words. Happy 70th birthday. 12) The real escapade of life doesn’t begin at twenty when you can travel the world, but at seventy when you can hardly even travel to the bathroom. Happy 70th birthday. 13) Seventy is not just the age to count your own blessings, but also to count how much of a blessing your life has been to others. Happy 70th birthday. 14) In the elaborate five course meal of life, seventy is when the best part is served – dessert. Happy 70th birthday. 15) Dream passionately as if you are in your youth, execute responsibly as if you are middle aged and advice generously as if you are a seventy year old. Happy 70th birthday. 16) Time is unfair – it has aged most of us but it refuses to touch you. Happy 70th birthday. 17) Seventy is not the time to write the last chapter of your life, it is the time to begin writing Part 2. Happy 70th birthday. 18) Congratulations for completing a long journey of life from pub hopping to pill popping. Happy 70th birthday. 19) You have worked hard for seventy years of your life, which is the reason your future generations aren’t seeing any strife. Don’t take your presence in our lives lightly, even though you are old we take inspiration from you to shape our destiny. Happy birthday grandpa. 20) You reap as you sow, which means that you will be pampered and showered with love by your children and grandkids for the rest of your life. Happy 70th birthday. 21) Seventy is the age that signals the end of working for your dream and the beginning of living your dream. Happy 70th birthday. 22) If you are so amazing at seventy, imagine how terrific you will be at eighty. Happy birthday. 23) Congratulations, all the expensive health insurance premiums you paid your entire life will now be put to good use. Happy 70th birthday. 24) You are a bubbly teenager in the disguise of an experienced seventy year old. Happy 70th birthday young man. 25) As your children, we are the fruits of a tree which owes its sweetness to the strength of its root – YOU. Happy 70th birthday dad. 26) Paris is not the most amazing place in the world, my grandpa’s lap is. Happy 70th birthday gramps. 27) Don’t hit your brakes at seventy, just change the gear. Happy 70th birthday mate. 28) If I become even half the seventy year old that you are, I will thank god for bringing me that far. Happy birthday dad, even at seventy you are a superstar. 29) You are the richest seventy year old man in the world because you own priceless wealth called Loving Family. Happy seventieth birthday. 30) Here’s raising a toast to your birthd….wait, I forgot you are not allowed to drink. Happy 70th birthday. 31) Seventy years are not enough for someone like you to spread all the happiness and love you possibly can. It will take many more decades to spread out your wings and shower all your limitless love on everyone around you. Happy 70th birthday. 32) The most endearing, enduring and encouraging character in the story of my life is YOU. Happy 70th birthday mom. 33) Dear dad, I owe my life to you because you have LIVED every year of your life to make mine more LIVABLE. Happy 70th birthday. 34) You have the stamina of a fifteen year old, smartness of a twenty-one year old, tenacity of a thirty year old, dependability of a forty year old, calmness of a sixty year old and wisdom of a seventy year old. Happy birthday. 35) Seventy is a magical milestone in your life. It makes you realize that there is still much more left in life to do while you still can. Go for it old man, live out all your dreams. Happy 70th.